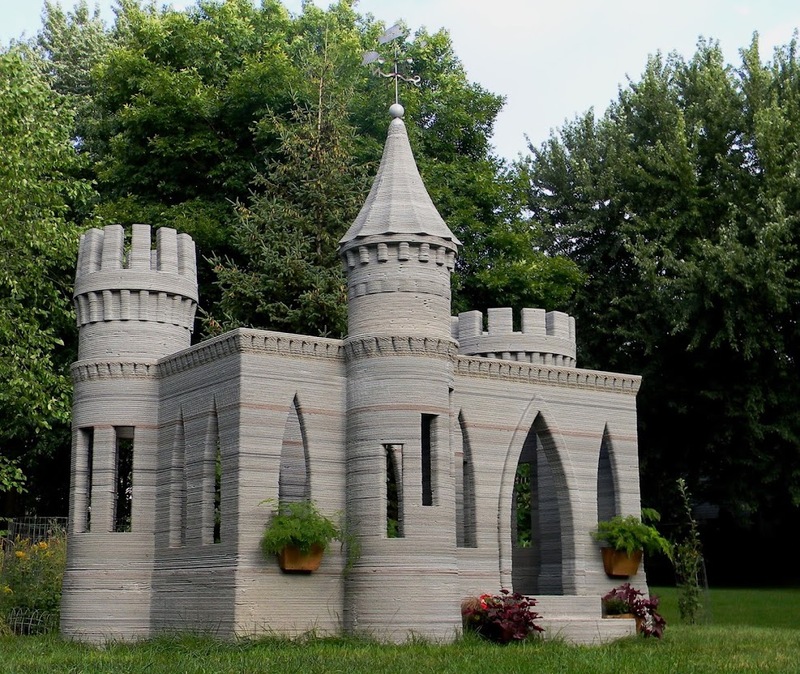 (3DPrint.com) Back in August, we reported on the world’s first 3D printed castle, designed and printed by a man in Minnesota, namedAndrey Rudenko. The miniature castle, which was printed in Rudenko’s backyard, garnered him plenty of media attention. There were people talking about his accomplishments all over the world, and it provided evidence that it is only a matter of time before 3D printing becomes a mainstream method of construction. At the time of the report, Rudenko told us that his next project would be to 3D print an enitre 2-story home, using this same technology. Here we are, 5 months later, and just last week we saw engineers in China 3D print a 6-story apartment building. This left us wondering a bit about where Rudenko’s plans stood, and if he had still planned on going forward with his own 3D printed house. Don’t fret! We have an update. Rudenko also has been following the developments in China, and he is quite excited about what he has seen, although he also sees some flaws with their methodology. While Rudenko believes that he has already proven his construction methods, he is still running into issues with government agencies who are not all that excited about allowing a 3D printed house to be constructed. He believes that his construction method is a more feasible one than the methods used recently in China. Rudenko has already drawn up sketches of the house which he would like to 3D print. He is still undecided if it will be one or two stories in height, but it will measure approximately 10m X 15m (approximately 33 ft x 49 ft), and the 3D printer he will use is much more advanced than the one which was utilized to print his castle back in August. He could create a much larger building, but his goal for now is to use his 3D printing technology, not only to create an aesthetically pleasing exterior to his house, but also an intricately detailed 3D printed interior. His 3D printer is currently able to produce the entire structure, without any need for manual touch in order to make the surface look more appealing. This version of Rudenko’s machine is a large and complex printer which has been highly engineered with specially designed equipment such as mixers, pumps, and other advanced technology. It is able to print in harsh conditions with +/- 2mm precision. It’s not just the 3D printer which Rudenko has come up with though that could be groundbreaking. He has come up with a “new revolutionary system of construction”, that uses 3D printing as well as a way of insulating the building, and heating it via solar energy. His method also includes a means of thermal mass heat storage. Rudenko’s method will produce the entire house, with no unnecessary labor or use of other large equipment such as cranes, large transportation trucks, etc, being required. It really is a revolutionary method of construction, that if proven and developed a little bit further, could equate to billions of dollars in construction savings annually. The idea and the machine is there, it’s just a matter of picking a location and raising the funds necessary to really go full steam ahead for Rudenko. He is currently looking for investors to back his machine, so that he can 3D print this house, sooner rather than later. He plans to continue the project whether he receives an investment or not, but says that he really needs a larger investment in the range of $1.5 – $2 million. There is no doubt in Rudenko’s mind that his technology is the “technology of the future”, and quite honestly, as someone who has been covering the 3D printing industry for some time, I would have to agree 100% with his assessment. However, investment is key to Rudenko’s technology taking off. He needs the funds for further research and development, as well as to hire legal representatives in order to convince governments that his technology should be viewed as a reliable, safe, productive means of construction. He has everything in place in order to begin 3D printing this first house. The costs though, are more than he can afford at the moment. Either way though, Rudenko plans to move forward, as he’s quite certain that there is a very strong interest in his technology. He tells us that he has received hundreds of emails from people who want to own a 3D printed house, but they are currently looking to spend less than it would cost them for a home constructed using more conventional means. Because this technology is new, Rudenko says that the price for the first house will cost more than the subsequent models, as all new technology starts out expensive. Without a doubt in my mind, I feel as though 3D printing will make a huge impact in the construction industry. Will it be this year, next year, or in 10 years from now? I really don’t know, but from the looks of things Rudenko is ready right now. What do you think about Rudenko’s plans to 3D print this large house? If you had the money, would you back his idea? What do you think of his sketched model for this home? Do you like the way it looks? Discuss in the 3D printed 2-story home forum thread on 3DPB.com. If you are interested in cooperating with Rudenko, he can be contacted via his website. Check out the detailed video below showing the printing of his original castle below. This entry was posted in Technology and tagged 3D printing, construction technology, printed house. Bookmark the permalink.